The Create a Coupon dialog box appears. Any order: Apply a discount to any order. Orders at least: Apply a discount to orders over a specified subtotal. Products by category: Apply a discount to products in a certain category. Single product: Apply a discount to a specific product. After you choose the coupon type, the Select Discount Type dialog box appears. Flat Discount: The discount is a flat dollar amount. Percentage Discount: The discount is a percentage of the cost. Free Shipping (Any Order and Orders at Least only): The discount is free shipping on the entire order. After you select the discount type, the Edit Coupon dialog box appears. Coupon name: Provide a name that describes the coupon. Promo code: Create your own promo code, or let Squarespace generate a random code for you. Discount: Provide a discount to be applied to an order. Minimum order total: Provide the minimum subtotal to which a discount will be applied. 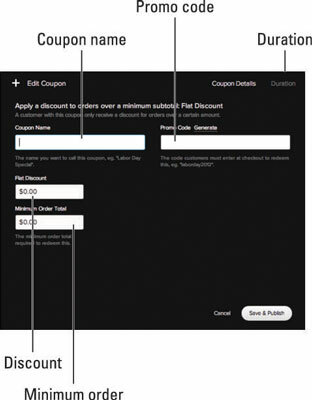 This option is available only to discount types in the Orders at Least coupon category. Categories: Select the category to apply a discount to when you create a Products by Category coupon. Find a product: Select the product from your inventory to apply a discount to when you create a Single Product coupon type. Set the duration of the coupon. At the top of the Edit Coupon dialog box, click the Duration link to view the duration settings. Set the beginning and end date and time the coupon will be active on your site. Save your coupon by clicking the Save and Publish button.